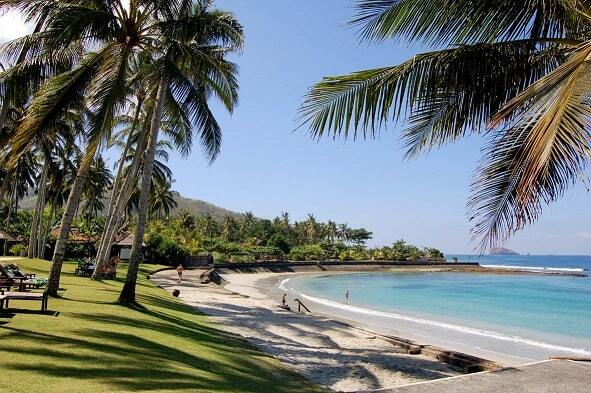 "Candidasa is a charming little town in East Bali that offers many amenities for tourists without being touristy. The main road is dotted with small hotels, guest bungalows, and restaurants serving a wide array of culinary options. Being only a short drive from the villa, we would hop over to Candidasa when we needed a little break from the tranquility, or in some cases when we needed to achieve an even higher level of calmness." Candidasa is a former fishing village situated on a bay on the east coast of Bali. On the origin of the name Candidasa are two different explanations. 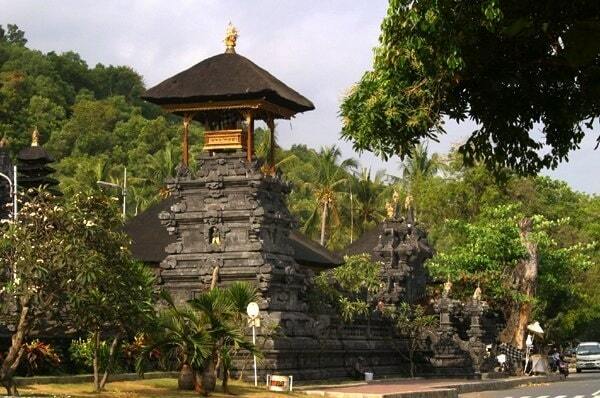 The first explanation tells us that the name derives from an old Balinese word meaning "ten temples" means. The other explanation is that other scientists suggest that the name is coming from the statue of the goddess of fertility Hariti. The image is located in the lower part of the temple, surrounded by ten children. The temple is a pilgrim destination (the name Candidasa comes originally from Cilidasa, meaning "ten children"). Childless couples often go to the temple seeking help from the goddess. Anyway, the temple facing the lagoon and is still often used for ceremonies by the inhabitants of Candidasa and the surrounding villages. Car and truck drivers use the opportunity to stop at the temple (Pura Candi)and get their car blessed just outside the entrance. During the seventies, tourism is extremely increased and there are built more and more hotels and resorts in Candidasa. Candidasa is located at a beautiful lagoon. There are also several parks and thermal baths in Candidasa, so the place is very popular with tourists. The local temple Pura Candi. The bay is a popular diving area with scuba divers. The village Bugbug and the white beach Pasir Putih (also called Virgin Beach) located approximately five kilometres to the north. Candidasa is located just south of the old native place Tenganan. Its not yet busy in Candidasa, but the town owns a lot of bars and restaurants to fun to reminisce after the activities of the day. From Candidasa you can arrange all activities in eastern and north-eastern Bali to do such as scuba diving, snorkeling (near Amed), trips to the market in Amlapura, Klungkung, the Besakih temple, the Bratan Lake, the temple of Bangli, shopping in Ubud and Sukawatti, to various water palaces such Tirtagangga and Ujung, hiking in the beautiful surroundings and ending in the village of Tenganan. Candidasa is also a good starting point for a few days to go to Lombok by ferry from Padang Bay or to the island of Nusa Penida. There have been recently added a lot of nice and new restaurants. The town has very much improved since five years ago. All bars and restaurants are situated in the main street. The food is good and well cooked. Almost all the restaurants and bars have Wi-Fi. Opposite the police station, there is a small market, the Pasar Batu Madeg. It is a popular place for locals to buy their bungkus (take-away food). The market remains open in the evening until the last customers have gone home. 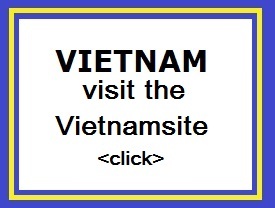 Pay also a visit to the Orchid Garden Candidasa with its many species of orchids and other colourful flowers. Candidasa is also conveniently located for excursions to Besakih and Tirtagangga, and further afield to Amed. From here you can also easily arrange a climb of Mount Agung and Mount Batur. Three kilometers north of Candidasa is the famous traditional Bali Aga village of Tenganan and weaving center, while the important hill top tempel Pura Gumang lies at the east. 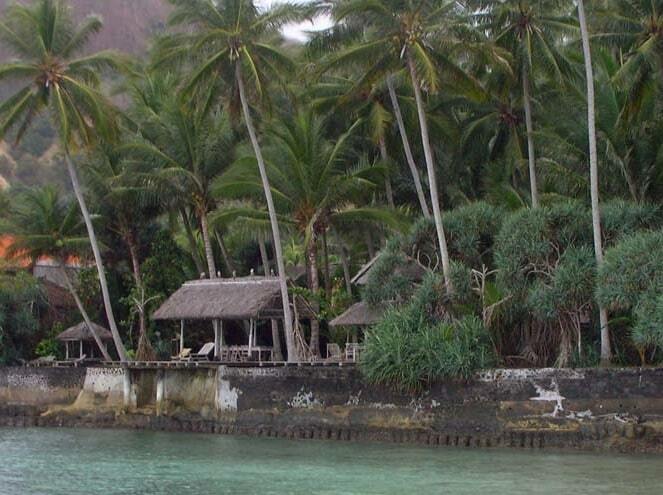 Diving, snorkelling at Padang Bai and Amed. You take a taxi from the airport. These are fixed prices when you buy a ticket at the taxi counter, which is located just outside the arrival hall. So close to the outside doors. Within a half hour (depending on traffic) you have done the 65 kilometers to Candidasa. 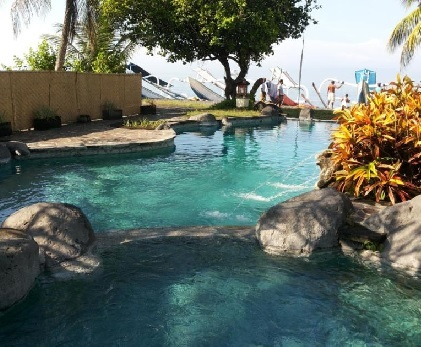 Located along Balina Beach in Buitan-Manggis (Candidasa), Abalone Resort offers an outdoor pool and massage services. Diving and snorkelling can be done by the beach. Free Wi-Fi is provided throughout the resort. Abalone Resort is a 15-minute drive from central Candidasa. Ngurah Rai Airport is a 2-hour drive away. Rooms are air-conditioned and each come with a terrace overlooking the sea. En suite bathrooms include toiletries and shower facilities. Selected rooms offer a flat-screen satellite TV, minibar and tea/coffee-making facilities. Guests can rent a bicycle to explore the surroundings, or head on a sightseeing trip arranged by the tour desk. Laundry services are available. A selection of Indonesian and Western cuisine is served in the resort�s restaurant. The main "town" is basically one long road that runs the length of the bay and whose beach side is lined by most of the hotels and guesthouses. The road forms a section of the main around-Bali-road so traffic noise is an issue � while you may notice it less during the day, in the evening and especially early morning it is a bit annoying to be awoken by thundering trucks rolling through town, so try to get a room as close to the water as possible � better to be woken by the waves than the number 42 bus. The town is split by an especially pretty lagoon that sits between the main temple in Candi Dasa and the sea. Lotus filled, with a small islet it is lovely in the early morning and late afternoon and it empties out onto a slither of sand where a handful of fishing boats are pulled up. You'll find more fishing boats on any bit of beach they can fit them onto.